I don’t remember where I heard, saw or read this, but I remember an interview with John Cleese, the estimable comedian behind Monty Python, Fawlty Towers and A Fish Called Wanda, that he had to learn how to do comedy differently for each of those works. When he moved on to doing a full half-hour show in Fawlty Towers, he realized there was a difference to how he was doing the few minute shorts of Monty Python. Then when he moved on to making a full feature film with A Fish Called Wanda, he realized that nature of the comedy had to change again. In each instance, while the formal medium essentially stayed the same, the presentation had to change because the length of time needing to be filled was growing. Over a long enough amount of time, a gag will become stale and die. Fawlty Towers couldn’t maintain the use of the same developing gag like a single scene could in Monty Python. Each episode of Fawlty Towers would have several gags of recurring story threads interwoven through it, so as one ended the next would become the focus and then the next and so on until returning to the first gag and so on. Then with A Fish Called Wanda, again a two hour movie couldn’t maintain the same structure of comedy and the movie had to incorporate elements of a different genre to maintain the audience interest. 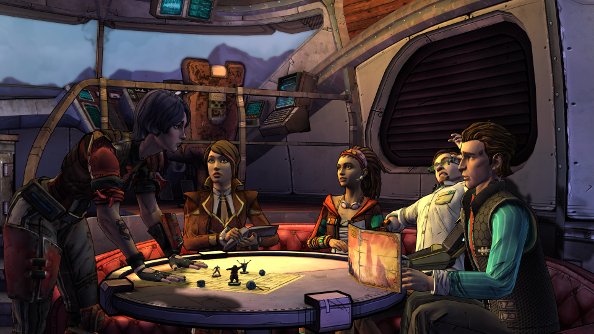 Each episode of Tales from the Borderlands runs longer than 2 hours. So the shift has been expected. By episode 3, Telltale has finally hit their A Fish Called Wanda moment. Were I to judge “Catch a Ride” solely on it’s laugh per minute ratio, or some other seemingly cringe worthy phrase of measurement, it wouldn’t stack up well to the game that Telltale had been crafting up to this point. There are fewer laughs, but in lieu of them, Telltale has brought another aspect of the game front and center, its heart. In between the world building of the scavenger hunt for the pieces of the adorable robot Gortys, whose parts we learn we’ve been assembling this whole time, Tales slows down the frantic pace to include quieter moments of Rhys and Fiona commiserating with their fellow companions. Having the two of them actually reach out and connect with them. Rhys finally has a talk with his buddy Vaughn about Vaughn and how he feels regarding the hectic situation they’ve gotten themselves into. Such a short conversation feels almost antithetical to what their relationship has been up to that point. One where Rhys claims the center of attention for himself and Vaughn plays the put upon sidekick. It’s a trope and I accepted it up to this point, but here we have some glimmer of what these two saw in each other to become friends. Then group splits up again. Rhys finds himself accompanying Sasha. While they have been together before, here the opportunity to build something more between them is offered and regardless if the player takes it, the feeling is still in the air. From the corporate sleazebag molding Rhys venerated and aspired to, he finds himself more comfortable with his seemingly suppressed humanist tendencies. Fiona, meanwhile, feels like she’s on her own journey of self discovery. She’s always defined herself as a con-artist, but after the events of the last two episodes she has begun to question what that term means to her and her sister and if it even applies to her anymore as new opportunities are presented. Much of this is done with her time with Vault Hunter Athena during the split up. It ends up turning into a sort of mentor/protégé relationship. The mechanics stay the same, but new framing is introduced as how to incorporate Telltale style binary choices into action sequences. The whole sequence ends up as a coping mechanism for coming to terms with the disastrous end to Fiona’s last mentor/protégé relationship. As Fiona tries to sort out her own place in the world, we can see that same quandary mirrored in Athena, who reveals her own relationship issues with her girlfriend Janey Springs and the lies she’s built up to maintain and keep her job separate her love life. Loaderbot and Gortys, as well, begin to cement their own camaraderie as only robots can. Eventually something goes wrong, because of course it does, and the zany, madcap, QTE fueled, chase sequence begins. In a way it seems like its trying to ape the race set piece sequence from the first episode, the major innovation this time being you know the names of everybody participating on both sides, yet it still feels like its trying to hit the same beats. The comedy doesn’t strike as hard, though the tragedy does. This time the chase doesn’t end in victory, but leaves the group at its lowest moment yet. Everyone is on the ground with the newly introduced villain Vallory and her gang hovering overhead. One of your number dragged away by vault hunters to be apart of a different game and the rest find themselves working under someone else’s heel. I look at that title, Tales from the Borderlands, and the most transgressive thing that it can do in light of its franchise is to ditch the cynical detachment and reach out for something human. The sly detachment of Rhys and Fiona is breaking down as both characters are reaching inside themselves for something real. Maybe, as posited above, that’s a result of the game’s inability to remain flippant the whole way through. It had to change itself up to remain funny and engaging in the first place. Whether that’s true or not, against the near mechanistic, nihilistic reality of Pandora and the shoot-and-loot nature of the main Borderlands games, in trying to present a standard narrative of likable characters unveiling their inner sincerity, Tales from the Borderlands feels subversive. I don’t know if that says more about, Tales, the Borderlands franchise or the mainstream video game industry as a whole.